Last September (Southern hemisphere spring), I gave out sunflowers, and invited people at Opawa to plant them as a sign of spring hope. Opawa has had many years of winters, and I suggested the seeds could embody our prayers for hope. Last nite, a church family popped around with this photo. 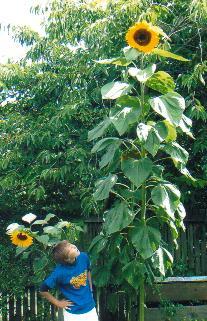 The sunflower stands over 3.6 metres tall. WOW!!! That’s soooo cool! My sunflower seed didn’t make it:( I’m not going to read too much into that tho!!! Larraine, were you around for the sunflower service? i can’t remember. Nah, but I was at Graceway when we planted them there.